Robin Williamson has for over 40 years been a pioneering and defining force in acoustic music worldwide and has played just about everywhere. Founder in the 60s of the influential Incredible String Band, he now presents a memorable evening of songs and stories - unique, off-the-cuff and in his inimitable style. He accompanies himself on harp, guitar, fiddle, border pipes and flute. Served with rice, black beans and a tomato salad. After dinner coffee bar and live 2 piece Cuban band. This enchanting show reflects upon about friendship and finding the way between two worlds. Malina is an excitable young girl who lives with Grandpa in the land of the midnight sun. Into her frozen world comes a stranger, whose ship is crushed in the ice. When Malina discovers her dream has become real she knows only she can save the stranger's life - with just a little help from Grandpa and his magic drum! 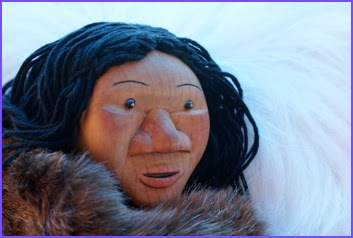 This warm-hearted tale, created by Angel Heart Theatre is inspired by true-life encounters between 19th century Scottish sailors and the Inuit communities of the Arctic. Breath-taking puppets, live music and a specially commissioned soundtrack create an unforgettable experience of magical theatre. Ben Waters is one of world's leading Boogie Woogie/Rock N Roll Piano players. Although only 35 he has entertained in Festivals, Theatres, and clubs for over 20 years, with over 3000 gigs under his belt. Together with his band he has toured the UK , Europe , Scandinavia , Canada , USA , the Middle East , Japan , Australia , and the West Indies . Ben’s energetic piano driven rock n roll shows have to be seen to be believed Ben Waters has a no nonsense approach to playing gigs. This is hard hitting music at its best. Combining the music of his heroes (Fats Domino, Jerry Lee Lewis Amos Milburn etc) with cutting edge original material. Ben Waters has shared the stage with some of the top names in the business, including Chuck Berry, Jerry Lee Lewis, Jools Holland, Ray Davies, Dave Gilmore, Dave Stewart, Shakin Stevens, Status Quo, The Beach Boys, The Pogues, Leo Sayer, The Teenagers, Chris Jagger, Freddie Star, Screaming Lord Sutch, Shirley Bassey - to name but a few. Ben is currently working with the fabulous Charlie Watts! TICKETS ONLY AVAILABLE ON DOOR!! Evershot's annual Harvest Supper. Come and enjoy home cooked food, Raffle, good company and our produce auction. Samay is a unique collective of five highly accomplished musicians from India and Europe, each member adding personal touches of Indian classical, samba, flamenco, jazz and funk; constructing original arrangements and exploring new ways of understanding and creating music, resulting in a powerful and distinctive sound. Featuring tabla, saxophone, sarod, guitar and bass. Together, they are a unique collective of musicians who bring their individual style, strengthen and passion to exploring new ways of understanding and making music. The idiom is contemporary. The lexicon, derived from Britain's multicultural diaspora. Samay is the voice of a new language in music. The date has now been set for the 22nd August!!!!! Good news and bad news!!!!!!!! The bad news is that this will be our final wakky race day!!! We will be running many of the old favorites this year, and some from the first ever wakky race day we also have a great new game drempt up by one of our youngest helpers Adam Cardale who is six years old he has come up with a cracker!!! places will be in short supply so you will need to be quick as we still only have 10 places people have been pushing money at me even before the date was set watch this space for more info and pass the word around for us so as people will save the date in their diary! Stompin' Dave (previously known as Dr. Stomp) returns to Evershot for a stonking extravaganza of American roots music. The night will showcase many aspects of Stompin' Dave music from bluegrass, old-time, and vintage country & western, to rockin' blues and boogie woogie. Dave will be joined by his band which features award winning bluesman Dave Saunders(The Producers) & the vastly experienced drummer Graham V.Bundy also Dave's old stomping partner Prof. Oz will be appearing as a special guest. Expect to hear singing, flatfoot dancing and a mind numbing display of instruments including electric and acoustic guitars, banjos, fiddles, lap-steel, keyboard, harmonicas, bass guitar, tea chest bass, drums and kazoo. We're not sure how we got them all on the stage last time and we're not sure how we'll do it this time - but they're back by popular demand after last year's sell out gig!! There won't be any tickets for sale before hand this time - so be sure to turn up early to avoid disappointment. The brilliant Jack Harrison and Jo will be providing the warm-up, you can click on the link further down the page to hear them on their MySpace page. Grab one now from their Shop! Inspired by infectious dance traditions and sounds from around the globe, Orpheus is now defining a fresh and varied sound distilled from soul funk, nu jazz, afrobeat, samba, drum n bass, ska, township and so on. From live experimentation within these formats, songs have been crafted by Andy Leppard and Steve Jones, with horn arrangements created by Simon Hartung. Following a string of live dates with a continuously expanding set, Orpheus is now recording and producing a collection of tracks to include a mix of live and studio recordings. Ro:toro play traditional Estonian melodies, with a piper, an improvising saxophonist, an electric guitarist and a quirky percussionist who uses plastic bowls on a bed of water, bicycle wheels and scraps of tin foil to create his rhythms. The group has its origins in Viljandi Cultural Academy of the University of Tartu, and they regularly perform at folk festivals both in Estonia and abroad. They work with traditional bagpipe tunes, original compositions and have been collecting the songs of Khant (speakers of the Finno-Ugric language Khanty, from remote parts of Russia), all to be included in their concerts as well as a flat foot waltz, and lots of polkas to dance to! Ro:toro guarantee an enthralling and engaging performance! Described as Dorset's biggest Folk band, this Somerset 10 piece play an Eclecticupbeat disco/folk mix . All proceeds from the gig will go to Friends of Sticklands Schools. Tickets will be available to buy in advance form Sticklands school and the Evershot Village Hall soon. Following the release of Trevor Moss & Hannah-Lou’s self-titled debut album on Loose Music, the pair will be eschewing the conventional live music circuit in favour of an enchanting tour of village halls, bringing along for company a handpicked selection of the best players from their famous London folk club, The Lantern Society. Their back to basics jaunt around the southern counties embraces a more rustic approach, advertising via the local post offices, pubs and village notice boards. Establishing their thriving folk club ‘The Lantern Society’ in 2008 and just completing the maiden year of broadcasting ‘The Lantern Society Radio Hour’ a bimonthly online radio show to great success, Trevor Moss & Hannah-Lou have become pivotal figures on the London folk and roots scene. Proof of this coming when The Camden Crawl, the capital’s biggest music festival headhunted the pair to sit alongside the industry’s elite on the festival committee for 2010. Trevor Moss & Hannah-Lou, keen to involve the local communities, have invited a selection of local acts from in and around each village to join the bill and pit their wits against the Big Smoke’s best. The Lantern Society Radio Hour will be producing and broadcasting a very special ‘Can’t Wait For The Spring Tour’ edition, capturing live the essence of the journey and continuing the modern field recording odyssey that is The Lantern Society Radio Hour. Plans are being made for a northern counties leg of the tour later in the year, followed by Scottish, Welsh and Irish legs.The album ‘Trevor Moss & Hannah-Lou’ is released on 15th February 2010 on Loose Music. The Lantern Society Radio Hour is available for free from their iTunes store or via the website. Hot Fingers welcome you to an eclectic mix of vintage acoustic string music. On this journey they visit the hot jazz of 1920's New York and sophisticated 1930's Swing, including references to the king of gypsy swing, Django Reinhardt. This is mixed with vocals of song-writing greats such as Cole Porter and Irving Berlin, as well as novelty features from the likes of Cliff 'Ukulele Ike' Edwards. Tom 'Spats' Langham has crooned his way around the world with bands such as the Pasadena Roof Orchestra and has several times sold out venues on the Artsreach circuit. Although just a trio, the band can be seen removing three guitars, a double bass, a sousaphone, a banjo, a mandolin, two ukuleles, a clarinet, a tuba, and a pair of castanets from the band van. Fabulous entertainment! Tickets: £7 for adults and £5 uner 18's.